1 What is the purpose of a portable dehumidifier? 3 Where should I put the dehumidifier? 4 What Are The Major Buying Frustrations? 6 What is the noise level? What is the purpose of a portable dehumidifier? If you’ve had trouble breathing in your home and you’ve noticed an increase in humidity throughout every room of your house, it might just be time for you to consider investing in a dehumidifier. A dehumidifier can help with preventing mold and mildew growth, manage your allergies, help with pest control, supplement your air conditioner, and maintain the structural integrity of your home. There are some very specific signs to pay attention to know if you need to purchase a dehumidifier for your home. You’ll start to notice water stains on the walls of your home or even on the ceiling. Areas such as your bathroom and closets tend to be extremely humid. You might start to even see black mold start to grow on walls or in your shower. These symptoms of excess moisture in your home can cause serious health issues that need to be avoided at all costs. Dehumidifiers will help reduce the humidity levels in your home, making your space feel lighter and fresh. They can also run very quietly so they aren’t annoying to have in as many rooms as needed, they’re very discreet. There are also many health benefits to having a dehumidifier, such as reducing odors that can be a side effect of mold and mildew in your home. They can also help to reduce irritation on your skin, discoloration, and allowing you to breath easier while moving through your home. In terms of the benefits towards your home, you’ll notice right away that your AC will work more efficiently which will, in turn, cut down on energy costs. You’ll also see that a dehumidifier will help decrease the dust in your home as well. - up to 1,300 sq. ft.
- up to 800 sq. ft.
- from 2,500 and 4,000 sq. ft.
- up to 4,500 sq. ft.
Where should I put the dehumidifier? If you’re considering something at a larger scale, we have written an overview of whether you need a whole house dehumidifier system, or maybe a portable dehumidifier is all your need. What Are The Major Buying Frustrations? Before you start jumping for joy and pulling your wallet out, there are some buying challenges you need to consider. When shopping for any kind of beneficial appliance, there are so many options to choose from online, it can be hard to really figure out what will work for you since you can’t just test it out for free. You’ll need to be able to choose something that’s reliable and easy to use, which is why we’ll be walking you through this guide so you will know everything you need to know to make an informed decision on which unit you’ll be purchasing. The price of a dehumidifier can vary greatly, depending on the size that you’re looking for and the kind of benefits you’re expecting to receive with the product. 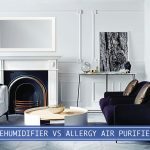 If you choose a dehumidifier that’s too small just to cut back on the steep price tag and plan to use it for your living room, you’ll notice right away just how much of a waste of money that will really be. You’ll end up wasting hundreds of dollars just for the small option when you will just have to rebuy a larger size. It’s very important to get the right size because while a smaller option will be able to get the job done you’ll be emptying the water reserve multiple times a day for it to function properly. Don’t let the price turn you away from an investment that will benefit the entire household. This kind of unit is too important to just ignore and opt for something not of high-quality standards. Just remember to pay attention to what you need out of your dehumidifier. Whether it’s 200 dollars or 700 dollars, you’ll be paying for your health and the benefits you’ll experience by getting a quality system that lasts. When buying a product online it can be quite difficult to figure out if it’s the right option for you. Especially when it comes to dehumidifiers because different models specialize in certain things more than others. Some dehumidifiers focus more on the dust problem in your home and act as an air purifier, while others focus on the humidity in the air, but don’t have anything to combat mold spores that already exist. It’s important that you read all the key features so you know exactly what each brand and unit specializes in. 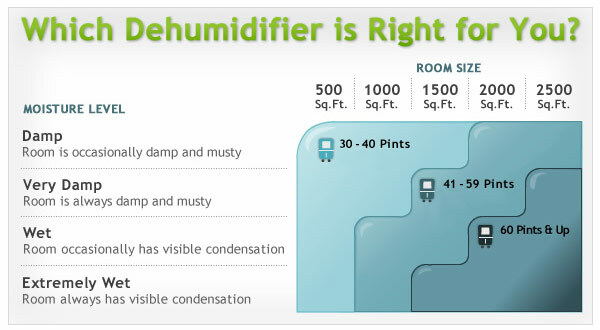 Don’t just assume that because it’s labeled as a dehumidifier, that it will do everything that you expect it to. Keep in mind that you should be looking for a very well rounded unit that does everything it’s supposed to do. A unit should be able to cycle the humidity out of the air, fight against mold and mildew spores in your home, while also making sure that dust is kept to a minimum. If the unit that you’re thinking of purchasing doesn’t do those things and more, then you’re looking at the wrong choice. Which is why we’ve produced this list for you to save money and time when shopping for a dehumidifier. Is brand name dehumidifiers worth it? Wherever you decide to purchase your dehumidifier from, keep in mind what brand you’re supporting. It’s important to know their reputation, their mission, as well as how well their customer service is. While most dehumidifiers offer a lifetime warranty, it’s important that the brand that offers those benefits are taken seriously and honor that promise. Often times brands that offer that life-time support will try to take advantage and make you jump through hoops before you get a replacement or help with a missing part or issue with the unit you purchased. Look over reviews of what people have said and judge for yourself if it’s worth purchasing something from that specific brand. Dehumidifiers come in all sorts of sizes and finding the right one can be daunting. First, you’ll need to find out the size of the area you want to dehumidify. Once you have a rough estimate, you’ll be able to get a loose idea of the capacity you will need to look for. Capacity is rated in pints of moisture removed per day, or 24-hour period. A great example is you see a “70-pint dehumidifier,” you’re looking at a model that is rated to remove 70 pints of moisture total per day. 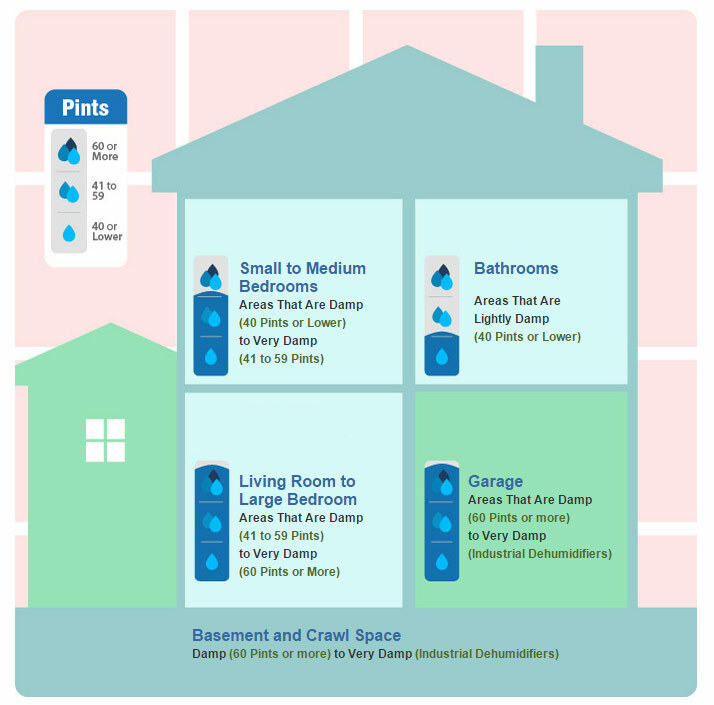 In addition to finding out your capacity, you’ll need to estimate how “damp” your space is. If you can measure that your room is a little damp, then you can just stick with the rated capacity for your square footage, however, if you measured that your room is really damp, then you’ll need to find a unit with a little more capacity. Another thing you may want to look out for is the noise level of these dehumidifier units. A lot of customers wonder how much noise these can actually make. One thing to note is that these units have to make noise because these machines work by physically moving air through them, but some models do vary in their noise control. Manufacturers have definitely taken steps to help reduce these noise by insulating the fan. 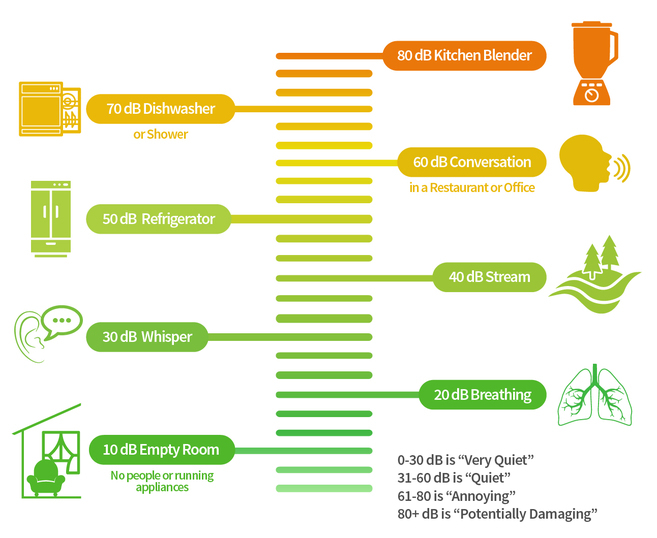 You’ll most likely find that the dehumidifier is measured in decibels (dB). So when you’re shopping for a new unit, you can take this chart along and compare it. There are some features that will best fit your needs and is a convenience to your lifestyle. 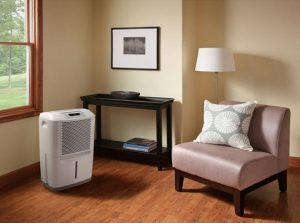 We’ve broken down some of the popular features that you might see in any residential dehumidifier that can fit in your home. An Automatic Humidistat – This is a nifty feature that can help maintain your desired level of humidity and it’ll run only when it’s needed, which will help in energy saving. Filter Indicator – Tells you when your dehumidifier’s air filter needs to be replaced. Electronic Controls – This can help you accurately adjust your humidity levels. Programmable Timer – You can program when to startup or shut off your unit. Operating Modes and Speeds – Allows you to give you multiple speeds and different modes for your dehumidification needs. Automatic Restart – This is a great feature for basements, giving it the ability to automatically restart in the event of a power failure. Low-Temperature Operation – Most of these units can operate down to 41 degrees Fahrenheit. If you’re looking for a dehumidifier in a cooler crawl space or basement, try to look for this feature. Automatic Defrost – Helps if you’re in a cold environment and defrosts any ice buildups to reduce downtime. Air Filter – If your dehumidifier has an air filter, it can be washed. The air filter helps to trap allergens and particles, protecting the units inner components from damage caused by debris. Some dehumidifier will have an ENERGY STAR® logo, and the energy performance is rated by the amount of water that is extracted every hour vs consumed. If you want to maximize energy performance, find a unit with this logo. Protects your home from mold, mildew, and excessive moisture. Helps eliminate bacteria in the air that can make it very hard to breathe. Has an option to save energy and money. Digital controls and included a timer so you can save power and wasted energy. Has three size options for different sized spaces. Touted as a number one best seller, the Frigidaire 70 Pint dehumidifier helps keep your space cool and moisture free. With the available options from this brand, it’s nice to see that they’ve been able to include three different options for sizes depending on what you will need for your unique space. There are three options, 30 pints, 50 pints, and 70 pints, each size will be able to accommodate the specific size room you need it for. Many individuals love how dry this unit makes their home feel, they’ve been able to clear up their allergies and their breathing troubles just by letting it run for the first day! While many have also complained about the fact they need to empty and clean the machine often, that will be the same process for any dehumidifier and it ensures that your air is as clean as possible! Protects your home from mold and mildew caused by excessive moisture. Helps diminish bacteria in the air which can cause many health problems and breathing issues. You are able to control the exact percentage of humidity in your room from the digital interface. Continuous operation is possible when the unit is located by a suitable drain. Effortless tank alerts will make the system auto shut off so you don’t have to worry about flooding. Comes in three different sizes for you to choose from. The most apparent stand-out feature from this unit would have to be how you can set what level of humidity you want in your home by the exact percentage on the digital interface. You’re able to customize what makes your home comfortable for you and your family and it will continue to maintain that percentage until set otherwise. This dehumidifier is one of the most popular options you can purchase and many customers agree that the precision and attention to detail when using this unit not only makes it unique but also essential for their day to day lives. Many individuals have had an issue with the gravity fed drainage system, but this kind of issue can be solved quite easily if you don’t want to have to empty the water reserve daily. Simply place the unit on a shelf or other higher up position so it can easily drain. Frigidaire Energy Star offers your home a cool and relaxed environment with less moisture and odor. 3 sizes: 30, 50, 70-Pint size for basements or other large rooms. Effectively removes up to 90% of moisture in the air on a daily basis. Reduces odor and bacteria to make breathing easier. Easily can be moved to any area of your household when needed because of added wheels and a drain hose outlet. Makes any room smell fresh and clean, cooling the room in the process. This dehumidifier is one of the leading units on the market as of 2018 due to its high impact on humidity when used. This sleek looking design is perfect for any large room, one of our favorite features of this product would have to be the sheer size and impact it makes on a space. This unit is a high powered option for those who need to quickly get rid of humidity in the air and also help fight against any bacteria that may be floating in your home or business. Many customers have loved using this for their musty basements and it makes a room actually livable! One downfall of this unit is also a positive, its size. While it will only work efficiently with a large room, it’s also hard to find a unit like this for this price in multiple markets. Keeps your space cool and comfortable by removing 30 pints of moisture a day. Prevents mold, mildew, dust, allergens, and odors for healthy air. Low maintenance and easy operation, all you have to do is plug it in. Uses an LED display for settings, speed, timer, filter alert, and more. Has casters, auto-defrost, and auto-restart. Perfect for smaller rooms such as a bathroom or bedroom. The Ivation 30 Pint Energy Star offers your unique space humidity free air while also making sure that you don’t have to maintain the unit as often as many other models on the market. Many times customers have complained that the system can be heard when it’s running, but because of how efficient the system works, you don’t need to leave it on all day if you don’t want to hear the slight noise it creates. Continuous drainage option available with a hose (not included). 4 Durable rolling casters for easy movement. When the bucket is full the unit will shut off. The Keystone Energy Star Dehumidifier offers a big punch for the size. This dehumidifier will help clear up to 50 pints of moisture per day. The biggest feature that you need to know about right away is the variety of settings this unit comes with. In different settings such as normal, turbo, and auto-defrost. This will leave you with more time on your hands where you won’t have to worry about constant maintenance that will fall on your shoulders each day. You won’t have to constantly check on the unit to see if it’s doing what it’s supposed to, it will manage everything itself and let you know when maintenance is actually necessary. Many customers have touted how much they love this system because of its price and how efficient it is once it’s set up and they no longer have to worry about it. Many individuals use it in the basement and have said that in only 8 hours, the humidity went from 90% to 50%! While many individuals have complained that their units have stopped working as efficiently as it did when they first set it up, it’s also imperative to know that they might not have been taking care of the system as they should have from the start. 30 pint (14.2 litre) capacity dehumidifier per 24 hours, Quiet operation, Adjustable humidity settings. Energy Star compliant, Direct drain system allows for continuous operation. The low-temperature feature allows the system to continue to operate until temperature reaches 5 degrees C (41 degrees F). One of the most amazing features that come from this unit is without a doubt the effectiveness despite its size. It runs just like a 50-70 pint unit, but it’s quiet, efficient, and works just as quickly as larger dehumidifiers. Even customers have come forward and said just how shocking it was to see how much water this machine takes out of the air in their home. They mentioned they lived in Florida, one of the most humid areas in the states, and it made their living conditions so much better ever since they started using it every day. Some customers, on the other hand, have said that after only a few months of running constantly, the unit has stopped working, but with a quick call to Arctic Aire’s customer service, it wouldn’t be a problem to replace and get a refund! The Arctic Aire 30 pint dehumidifier is ideal for those who want to have a system in a smaller space, such as an apartment, bedroom, or kitchen. 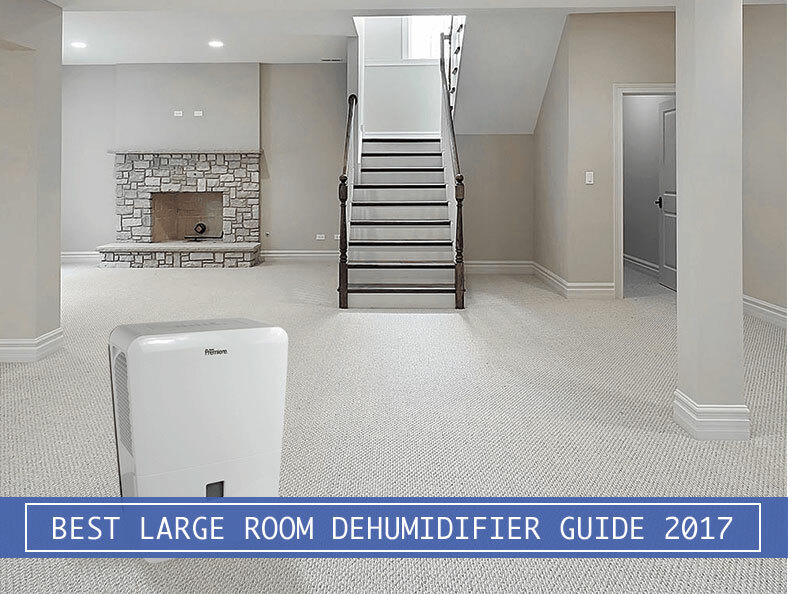 As you’ve made your way through this guide on the best dehumidifiers of 2018, you’ll most likely know by now that there are tons of options and many have exactly what you’re looking for. But it’s important to remember to purchase a unit that works well with your space, that way you won’t be wasting money and you’ll be able to get the most out of any unit you purchase for your household. There is a good chance that you’ll find exactly what you’re looking for on this list, so you won’t have to waste any more time searching through hundreds and hundreds of reviews on a product you don’t know if you can actually trust or not. While a dehumidifier seems simple at first glance, this guide has walked you through all the ins and outs you need to pay attention to fully appreciate each little difference and feature that is available. From the size, price, brand, and how silent the unit is, you have quite the selection to sort through and hopefully one will stand out to you and your family more than the others. By making this investment you’ll be making a promise of good health and care for yourself and your family. We hope that you have all the necessary information that you may need to make a smart choice on your next investment for a better lifestyle and healthier habits. We’d like to thank you for taking the time to read through what we have to say, good luck in finding a dehumidifier that works the best for you and your household!